If you’ve never had to go out and chop firewood for something then I can tell you from firsthand experience you’ll find few activities as difficult or as satisfying in the end. It’s a massive pain in the a**, sure, but you’re left with the good kind of ache afterwards and enough chopped wood to last a while. The only problem is it takes so long to get it all done that you could be at it for hours before the end is in sight. Over the many years we’ve had lumberjacks we’ve also been working to optimise the technology and machines they use to the point where monsters like this firewood processor can to fruition. Knowing how difficult chopping wood can actually be, it’s even more ridiculous seeing how much firewood this one machine can pump out as fast as it does. What would normally have taken 1-2 minutes takes the processor seconds, making you wonder how many people it replaced. 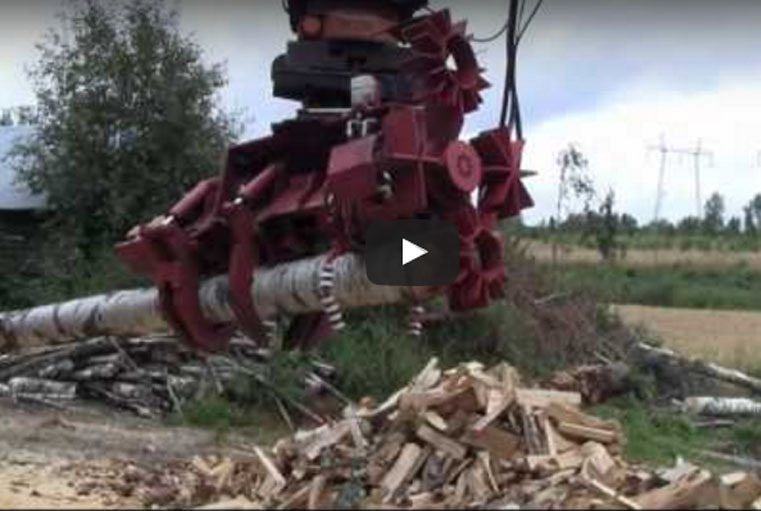 Either way, this machine takes full logs and slices little sections off at a time; those little sections are then pushed through a set of blades that cuts it into firewood chunks. I wonder how many log cabins this thing could provide the firewood necessary to keep them warm in a single day because after a display like that I bet it would be a lot. Could you imagine just letting this thing run for ten minutes and being set for the winter? Goodbye heating bill..